If you've been looking for the PERFECT VACATION home, you have just FOUND it. LOOK NO FURTHER. Our luxurious 5 bedroom home has everything you could want and more. HD TV's in TWO ENTERTAINMENT AREAS, TV's in every bedroom, 2 sets of washers and dryers and 2 GOLF CARTS for a fun ride to the BEACH and POOL COMPLEX. And best of all; the LOCATION!!! It can't be beat. Our home is located just minutes to the south of Myrtle Beach proper, AWAY FROM THE CROWDS but easily accessible. Although not directly on the beach, the golf carts make getting to and from the beach and pools both fun and easy. Our private beach parking area is right next to the fabulous Conch Cafe restaurant, one of the best restaurants in the area is right in our backyard. It takes less than 4 minutes to get to the beach parking area from the house in the golf carts. If you want to MAKE THE MOST of your too short VACATION, don't pass up this GREAT OPPORTUNITY! Great for multiple families! Each of the 5 bedrooms has its own TV some with DVD player, 3 have private baths while the 2 lower level bedrooms share a bath. This home can easily accommodate 19 guests, ALL IN BEDS! 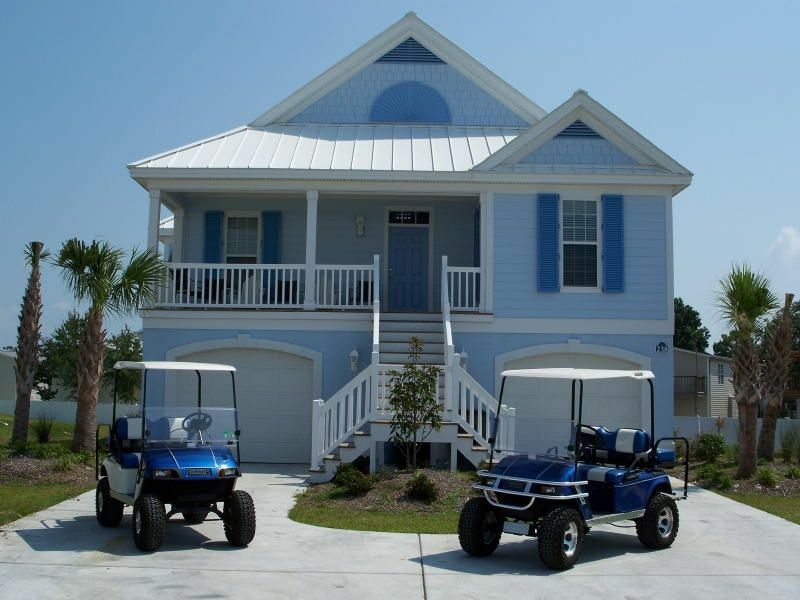 This home is 'TUCKED AWAY' in a beautiful beach community, yet beach access can’t be any easier, especially with the included golf carts. Shopping, supermarkets, restaurants, and other necessities are all close at hand. We also have an indoor and 2 OUTDOOR POOLS that are very close by. There is also a popular WATER PARK with GO CARTS practically across the street. DON'T PASS THIS ONE UP!! Give us a call and we'll help you plan your PERFECT ESCAPE to the beach! All bedrooms have DVD players. On-site recreation facility including: indoor and outdoor pools, tennis courts, and playground. Located right at the Surfside Beach – Garden City border; the entire area is far LESS CONGESTED, enabling you to get the most out of your too-short vacation. Surfside Beach, known as the 'FAMILY BEACH' offers a wonderful, private atmosphere, just a few minutes south of the attractions and entertainment of Myrtle Beach and just a few minutes north of the fine dining of Murrells Inlet. Golf: If you love golf, you can practice at Tupelo Bay!! Located across the street from the Bermuda Bay entrance. It has mini golf and a lighted driving range. If you prefer to golf elsewhere, top rated courses such as True Blue, Caledonia, and Heritage are very nice courses and all just a few minutes away.